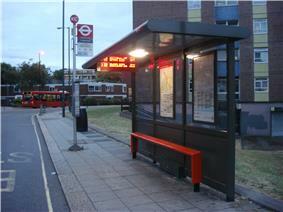 An example of a typical London bus stop. London Buses is the subsidiary of Transport for London (TfL) that manages bus services within Greater London. It was formed pursuant to the Greater London Authority Act 1999 that transferred control of Greater London's bus services from National Government's London Regional Transport to the Mayor of London. producing leaflet maps, available from Travel Information Centres, libraries etc., and as online downloads. All bus operations are undertaken under a tendering system in which operators bid for routes in return for a set price per route operated. Contracts are normally for five years, with two-year extensions available if performance criteria is met. Routes are set up, controlled and tendered out by Transport For London (TfL) and they provide day to day assistance via CentreComm which coordinates a large scale network of Network Traffic Controllers to help with any traffic issues that may occur. Operators provide staff to drive the buses, provide the buses to operate and also adhere to set TfL guidelines. Operators are then in return paid per mile that each bus runs, the pricing is announced on new tenders. London Buses publishes a variety of bus maps. Some are traditional street maps of London marked with bus numbers. In 2002, TfL introduced the first "spider" maps. Rather than attempting to cover the entire city, these maps are centred on a particular locality or bus station, and convey the route information in the schematic style of Harry Beck's influential Tube map, capitalising on TfL's iconic style of information design. The arachnoid form of bus routes radiating from a centre earned them the nickname "spider" maps, although TfL refer to them on their website as route maps. The maps are displayed at most major bus stops, and can be downloaded in PDF format via the Internet from the TfL website. The legal identity of London Buses is actually London Bus Services Limited (LBSL), a wholly owned subsidiary of Transport for London. East Thames Buses was the trading name of another wholly owned subsidiary of TfL called, rather confusingly, London Buses Limited (LBL). LBL was formed on 1 April 1985 as part of the London Regional Transport (LRT), holding twelve bus operating units (from late 1988) and other assets. The operating units were sold off in 1994/95, and their purchasers make up the majority of companies awarded bus operating tenders from the current London Buses (LBSL). After 1994/95, the LBL company lay dormant, passing from LRT to TfL. It was resurrected when East Thames Buses was formed, separated by a chinese wall from LBSL, and acted as a London bus operator by proxy. The local bus network in London is one of the largest and most comprehensive in the world. Over 6,800 scheduled buses operate on over 700 different routes. Over the year this network carries over 1.8 billion passenger journeys. Buses in the London Buses network accept Travelcards, Oyster card products (including bus passes and Oyster pay as you go) and contactless debit and credit cards. Cash fares have not been available since 6 July 2014, but Day Bus passes (issued either as a single use Oyster card, or on paper from station ticket machines) were re-introduced on 2 January 2015. Single journey fares used to be charged in relation to length of journey (fare stages), but are now charged as single flat fares for any length of journey. From 2000, the flat fare was higher for journeys in Zone 1 than in outer zones, although from 2004 this difference was eliminated, the change coinciding with the introduction of Oyster card flat fares. With Oyster pay as you go, users are charged a set amount for single journeys, although there is a "daily cap", which limits the maximum amount of money that will be deducted from the balance, regardless of how many buses are taken that day (from 04.30 to 04.29 the next day). Alternatively, weekly and monthly passes may also be purchased and loaded onto an Oyster card. Passengers using contactless payment cards are charged the same fares as on Oyster pay as you go. Unlike Oyster cards, contactless cards also have a 7-day fare cap though it currently only operates on a Monday-Sunday basis. All children under 11 travel free. Children aged 11 to 15 travel free on buses with an 11–15 Oyster photocard; without an Oyster card or Travelcard, they have to pay the full adult fare. Visitors can have a special discount added to an ordinary Oyster card at TfL's Travel Information Centres. There are also concessions for London residents aged 16 to 18. The Freedom Pass scheme allows Greater London residents over state pension age, and those with a disability, to travel free at any time on buses and TfL's rail services. People who have concessionary bus passes issued by English local authorities travel free on TfL bus services at any time. Each company has its own operating code, and every bus garage in London has its own garage code. The various bus operators providing services under contract to London Buses operate a wide variety of vehicles, about the only immediately obvious common feature being their use of a largely red livery. 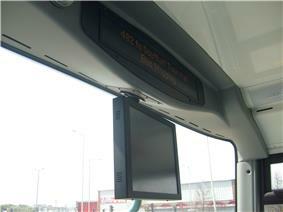 However, London Buses in fact maintains a close control over both the age and specification of the vehicles. Particular examples of this include the use of separate exit doors, increasingly unusual on buses in the United Kingdom outside London, and, on double-deckers, the use of a straight staircase where most other UK operators specify a more compact curved staircase. Additionally, London Buses also specifies that vehicles operating in London use traditional printed roller destination blinds, whereas in most other parts of the country, electronic dot matrix or LED displays are the norm on new buses. These have been known to tear and get dirty quickly, however there have been improvements with LED Backlights and the 'SmartBlind' system installed on newer vehicles. Because of London Buses' close control on the age of the fleet, it is very common for London buses to be cascaded by their owners to operations in other parts of the country after only a few years' service. All of London's buses use the London iBus system, an Automatic Vehicle Location system that provides passengers with audio visual announcements, and are able to trigger priority at traffic junctions. The system was on trial in 2006, and had been extended to almost all bus routes by 2009. ^ a b c d Transport for London. "London Buses". Retrieved 13 November 2007. ^ Dodson, Sean (28 February 2008). "London buses headed in the same direction as Helsinki's high-tech transport system | Technology". The Guardian. Retrieved 2 February 2010. ^ "London Buses tendering system". Transport for London. 28 December 2010. Retrieved 28 December 2010. ^ Mayor of London. "Transport Strategy – Buses". Archived from the original on 5 October 2007. Retrieved 13 November 2007. ^ Transport for London. "Bus route maps". Retrieved 13 November 2007. ^ Leaflet 'Contactless travel' published by TfL. ^ "Children and students | Transport for London". Tfl.gov.uk. 19 January 2010. Retrieved 2 February 2010.